Your children will think they have flown away with The Lost Boys with this unforgettable bespoke hideaway. Sitting on the edge of the garden by shady woodland and offering wonderful views up to the main house, The Neverland Treehouse promises a magical adventure that the whole family can enjoy – where happy thoughts are easy and children won’t want to grow up. 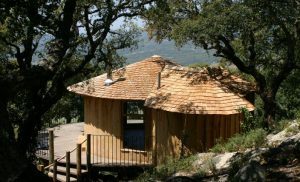 The beautifully cut Cedar shingles are the first thing that catches your eye, and these will magically fade into a silvery grey colour as time goes on, making the treehouse camouflage into its natural surroundings. Climbing up the rough-hewn spiral staircase is like entering your own faraway world, with a snug open-plan treehouse spacious enough for sleepovers and treasure hunt meetings. Embrace your sense of adventure and keep watch for pirates on the look-out deck or slide down into a mermaid lagoon below. Play follow the leader over rope bridge gangways or fly across the garden on a zipwire covered in pixie dust – children can spend hours playing imaginary games in the sunshine. 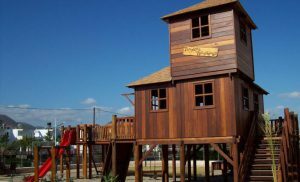 We don’t believe that there was only one child who never grew up, so although ideal for keeping energetic kids entertained, the treehouse also offers a secluded spot for the adults to sit and remember what it was like to climb trees again. Each year around 13,500 children visit Sir Harold Hillier Gardens in Hampshire as part of a school educational day and 27,000 visit with their families.